Soft-tissue sarcomas in infants and children are unusual tumors, representing the fourth most common malignant disease in patients under 15 years of age (Table 13-1) (42). They represent a significant percentage of the solid neoplasms arising in children and frequently present both diagnostic and therapeutic dilemmas. In recent years a great deal of interest has centered on the marked improvement in disease control that has resulted from combined-modality treatment of rhabdomyosarcomas. 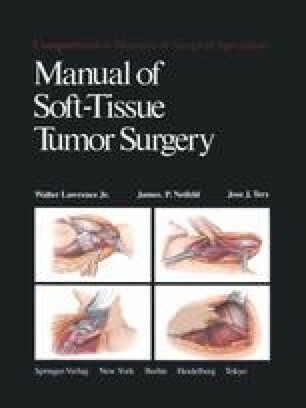 Other forms of soft-tissue sarcoma arising in childhood are much less common, less is known, about their natural history, and combined-modality therapy trials for these lesions are nonexistent. This chapter will review the sarcomas arising in childhood and the differences when compared with adult sarcomas. The main thrust of this chapter will be the discussion of the emerging data on rhabdomyosarcomas.